Finally, we have had a decent flood, with the river hitting 80 on the gauge yesterday and running at 50 this morning. We have had significant rain over the last few days, 60mms since the 29th, 26.4mms of which fell yesterday. Water temperatures have also dropped to the low teens and the fishing has improved dramatically, which wouldn’t be hard in fairness. There have been twelve fish landed since my last update, of which eight have come in the last 24 hours. We had four before that in difficult enough conditions. 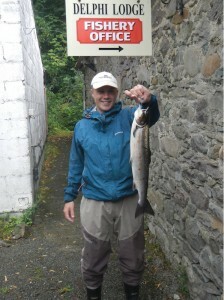 Ken Mills had one on the 25thof July from the Turn Pool of 5lbs2ozs on a Cascade, when the river was still -4. We got some nice misty rain on the 25th, 26thand 27thand this eventually put the river to 20 on the 28th. Alexander Mills had a fish that day, not his biggest by any means, weighing in at 2lbs, taken from the Deadmans on an old Mills favourite, the Willie Gunn. 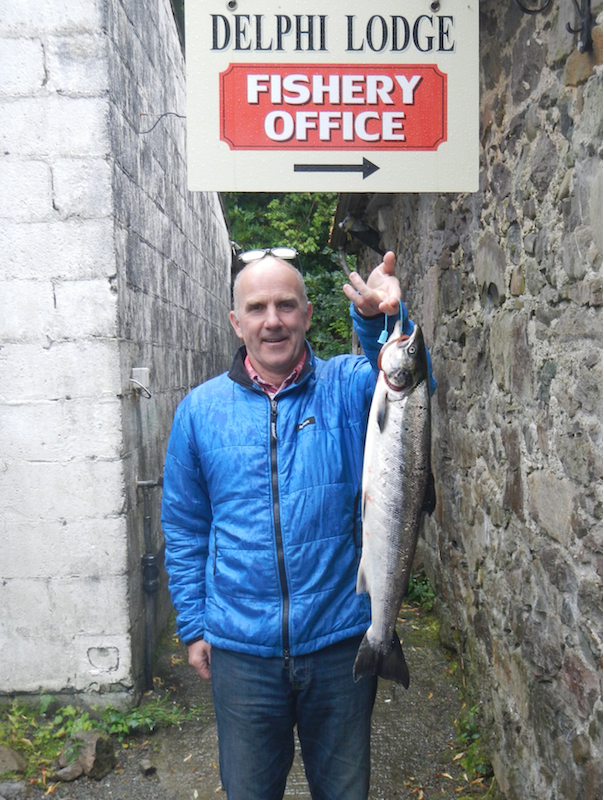 Ben Johnson managed to land his first ever salmon on the 30th, a fish of 3lbs14ozs from the Boat Point on Finlough on a Gary Dog. By the 31stthe river was finally at a decent level, 35 and Giles Johnson had a lovely fresh grilse of 5lbs5ozs from the Kings Pool on an Ally Shrimp. That brought our total for July to fifteen, which is obviously well below our 10yr average. We had proper rain that night and with the further rise in water, we then had eight fish in 24 hours. Kurt Roth had two of these, the first of approx. 4lbs from the Meadow Pool on a Yellow Shrimp and the second also from the Meadow of 2lbs14ozs on a Yellow Shrimp. 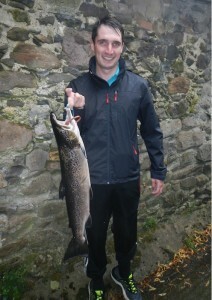 Malachy Donnelly had a fish in the Rock Pool of approx. 3.5lbs on a Delphi Collie. 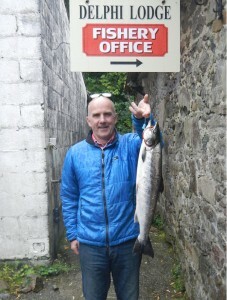 Peter Joyce had his first of the season, of 4lbs6ozs from the Deadmans on a Willie Gunn. 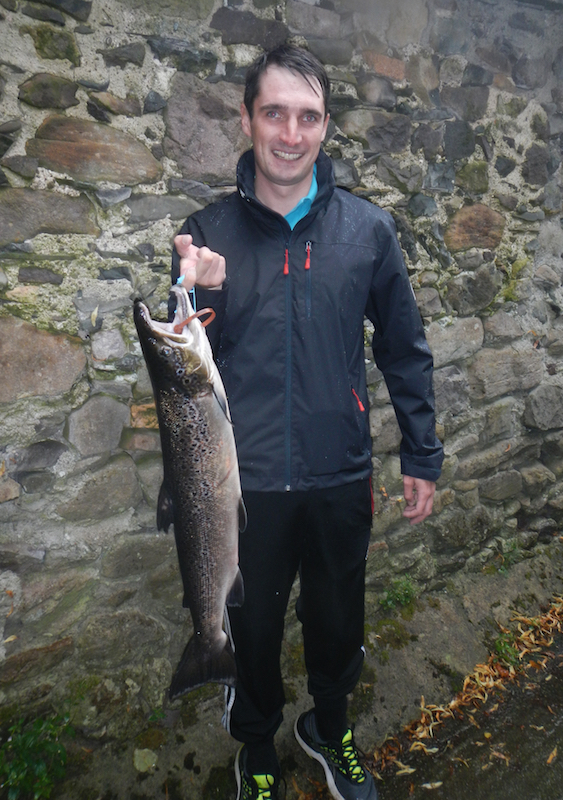 Hamish MacAuley landed a big old fish off Finlough of 10lbs14ozs on a Brown Shrimp. All that activity happened before 12 mid-day and after persistent heavy rainfall the river got very dirty and went to 80 by 4 o clock in the afternoon. The river settled down from about 7pm and was in lovely fishing order. Robert Gillespie duly took advantage of the good conditions and landed two, one from the Bridge Pool of 8lbs and the second from the Turn of 4lbs11ozs, both on a Delphi Collie. 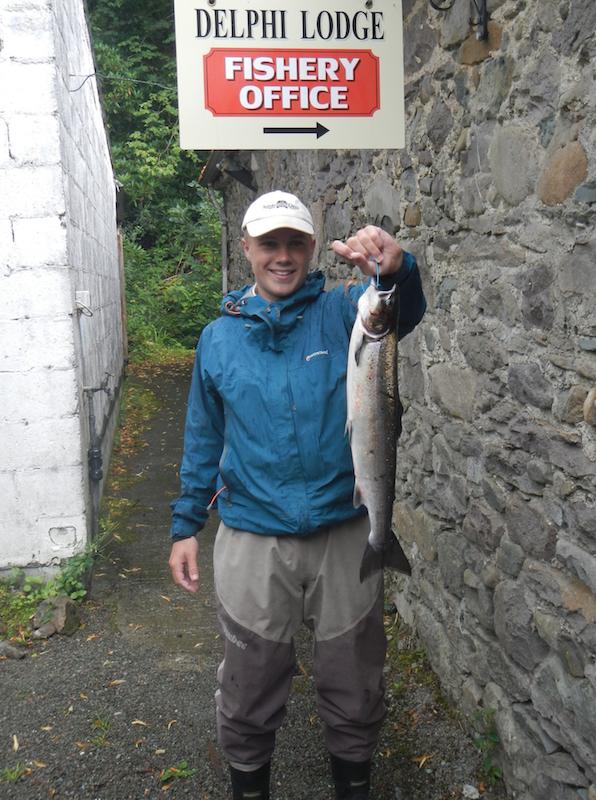 He also landed 9 sea trout, so I would expect the Sea trout fishing to pick up in the next couple of weeks.